Can you believe it?? Six days in a row with a new recipe!! It must be some sort of miracle! And for Taco Tuesday and Sammich Saturday to both re-appear in the same week – well, that’s just some sort of amazing right there y’all. Some would argue that a quesadilla is not a sandwich. I would disagree. I mean, it’s a quesadilla by name, but it is made up of delicious filling between two tortillas that are NOT folded like a taco. So, in essences it is very similar to a sandwich, don’tcha think? Maybe closer to a panini since it’s crisped up in a pan? Whatever you want to call them, they are beautiful, delicious morsels that I love to devour. This particular panini is J’s favorite. I’ve made it countless times over the last year and failed to get a picture every time. Shocker, right? But this time I was determined to get a picture and get this tasty quesa-sammich-dilla on the blog!! Now, this is a crock pot recipe so you have to allow yourself some time, but let me just tell you how awesome your house will smell while it’s cooking. Which could be considered a bad thing if you’re starving. So, maybe keep yourself busy outside to avoid the “OMG I’m starving to death, if I don’t eat right now my stomach will eat itself!” panic attack. The results are well worth the wait, I assure you. I actually put these in the crock pot on Sunday morning before we left for church and let them cook while we were gone. We were gone a little longer than I expected since we went to have lunch with one of J’s sisters and her husband’s family, but luckily we got home before there was disaster. Burnt chipotle beef would have been a less than desirable outcome, for sure. And just look how beautiful those quesadillas are. 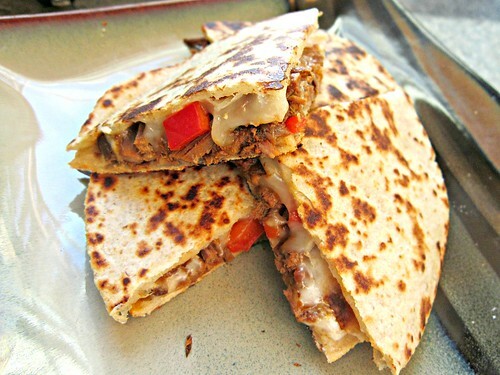 Pretty red bell peppers mixed with chipotle beef and ooey gooey melty cheese, between two toasted tortillas. Yep, that’s a pretty spiffy meal right there my friends. Oh, and of course you have to serve it with some deeelicious guacamole. And sour cream or Greek yogurt if you’re into that kinda thing. I was sort of starving when I made these so I whipped up some guac and called it a day. And I’ll be honest…I forgot to add the extra cilantro when I put them together. Don’t do that when you make them. When you’re to the point of being hangry, it’s best for all involved to just get food in my belly. Ask my mom. A hangry Jaida is not a pleasant one to be around. But one quesadilla later and all was right in the world. My naturally sunshiny disposition had returned and the family was full and happy. That’s a good day right there. Place your steak in the crock pot and top with chipotles and adobo sauce, scallions, 1/2 cup of the cilantro, lime juice, salsa and a good pinch of coarse salt and pepper. Cook on high heat for 3-4 hours, or low heat for 5-6 hours. Flip it every hour or so, if you are able. Meanwhile, make your guacamole. Place your avocados in a medium bowl and mash until there are no big lumps. Add lime juice, garlic powder, salt and pepper and stir to combine. Taste and adjust seasonings as you like (more lime juice and garlic powder never hurts!) Cover and refrigerate until ready to serve. When it’s done, you’ll be able to stick a fork in there and easily shred the meat. Heat a skillet over medium heat. Add a tortilla to the pan.Top with cheese, then a layer of the shredded beef, some red bell pepper, cilantro (don’t forget like I did this last time!) and finally more cheese! And of course another tortilla. Heat until the cheese on the bottom side is melted and the tortilla is browned and slightly crispy. Gently flip the ‘dilla to repeat this process on the other side. Remove from the heat and repeat for remaining tortillas/’dillas. Cut each one into four little triangles and serve with guacamole.